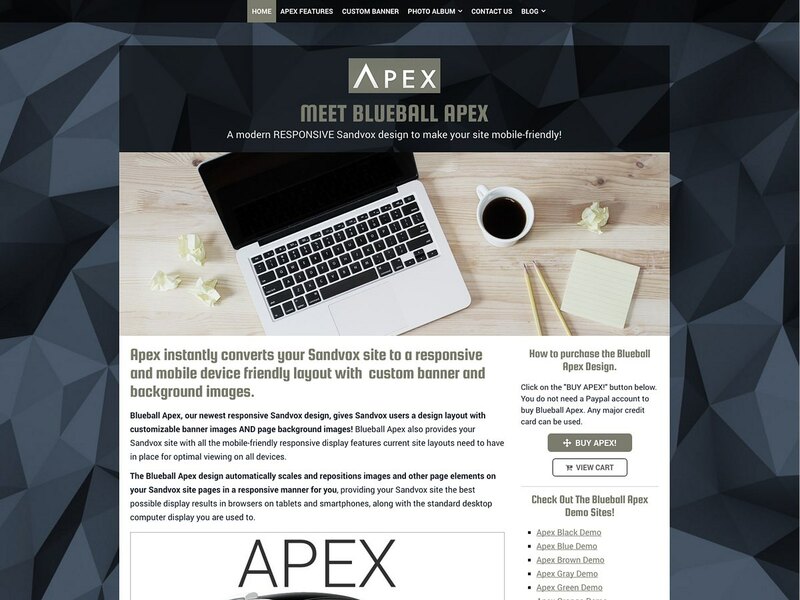 » New Blueball Apex Responsive Mobile Friendly Design Released! New Blueball Apex Responsive Mobile Friendly Design Released! 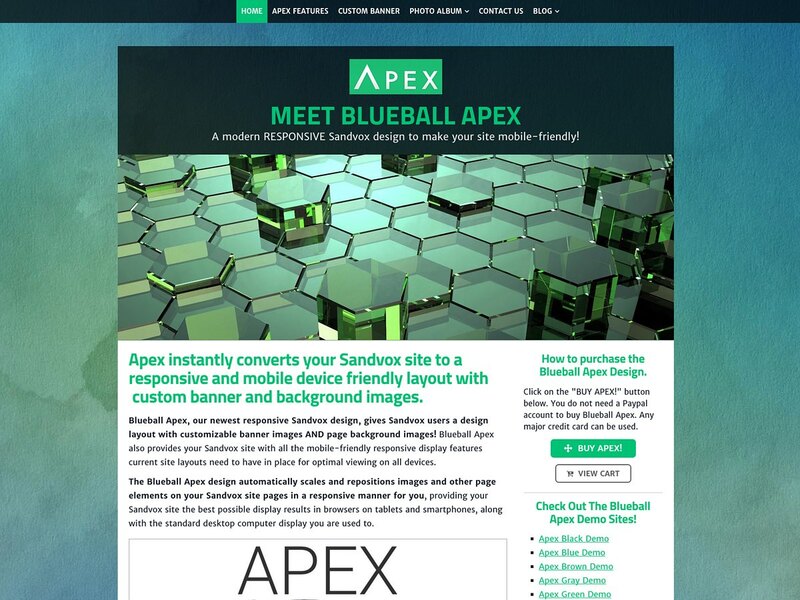 I am proud to announce the release of our new BLUEBALL APEX Sandvox design that features, for the first time ever in a Sandvox design, custom full screen page background images! 16 preset custom banner images! 16 preset custom full screen background images! Multi-level desktop and mobile nav menus! Detailed user guide and customizing guide with custom font examples, banner images and background images! Blueball Apex design details page. Let us know what you think about our Blueball Apex design, and any questions you may have on its features. 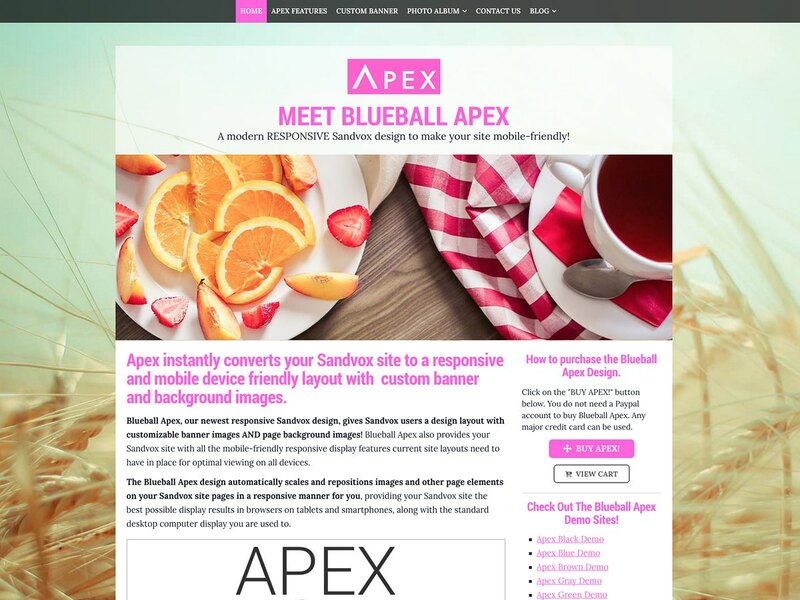 Send us your site url too when you publish your Blueball Apex site so we can check it out. Many thanks for your continued support of our Sandvox designs! As always, it is very much appreciated. 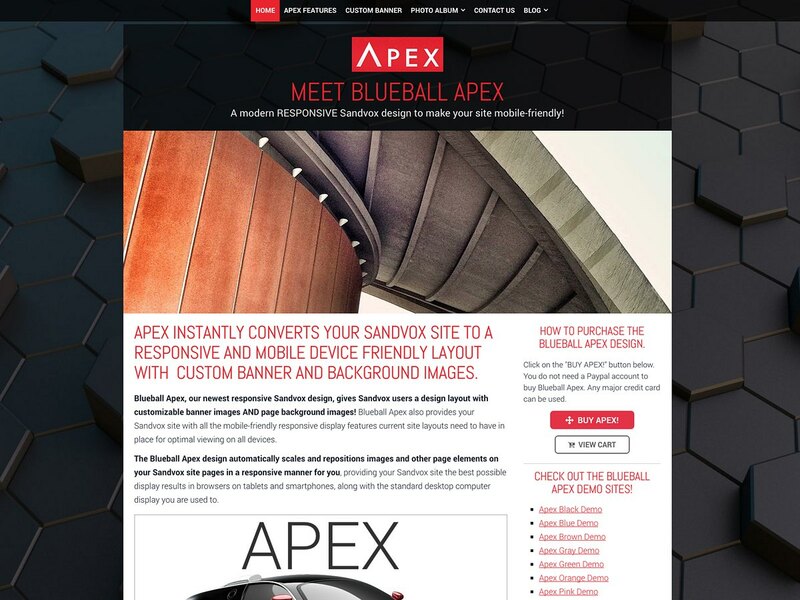 Re: New Blueball Apex Responsive Mobile Friendly Design Released! I just uploaded 7 new custom banner images and 13 new custom full screen background images for Apex design users to use. Some of these images were used on our Apex demo sites. To enable their display, just adjust the image file name in the code and increase the banner image number from 17 up to 23, and the custom background image numbers from 17 up to 29 to have them display in your site. Thanks for the tremendous initial response for the Apex design release. I hope everyone is enjoying using Apex on their responsive Sandvox sites. Thanks, Charlie, I've bought in -- I've just finished another motel in Simplex -- www.victorymotelpng.com -- and the owner is stoked. So am I, actually! Hopefully I'll have another commission in the next day or two and one in particular is practically made for Apex. Or maybe Apex is practically made for it. Great designs -- and in this country of increasing internet activity on mobile phones, the reactive capability is a must.